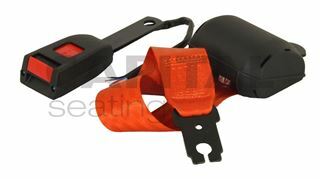 A durable 2-point ALR retractable lap belt with blade buckle, complete with 3-wire switch. Suitable for a range of applications including cars, vans, forklifts, tractors, construction machinery and more. The wire connects into your vehicle's operator presence system, suitable for applications where the vehicle requires a connected seat belt to meet safety parameters. The webbing is a high-visibility orange to meet certain safety criteria.